PFA Scotland is delighted to announce the nominees for this season’s Championship, League 1 and League 2 Player of the Year Awards 2016. Championship nominee Lee Wallace has previously been a winner at the PFA Scotland annual awards having won the League 2 Player of the Year accolade in 2013. The other three candidates are all nominated for the first time. 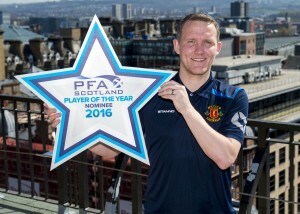 Peterhead striker Rory McAllister already has a hat trick of PFA Player of the Year awards to his name – two from League 1 in 2010 and 2011 and one from League 2 in 2014 – and finds himself up for nomination again after another successful season on the goals front. Bobby Linn, from Arbroath, is hoping to do back-to-back wins in the League 2 Player of the Year category after scooping the award last year. For more information please contact Michelle Evans on 07796 171490 or email michelle@pfascotland.co.uk or alternatively call Paul Kiddie on 07852 988828.